Sinopsis: While repairing a satellite, two astronauts suffer a serious accident and are floating in space. They are Dr. Ryan Stone (Sandra Bullock), a brilliant engineer making her first space mission, and veteran astronaut Matt Kowalsky (George Clooney). The outer mission seemed routine, but now they are completely alone, they will try by all means to find a solution to return to Earth. (FILMAFFINITY). 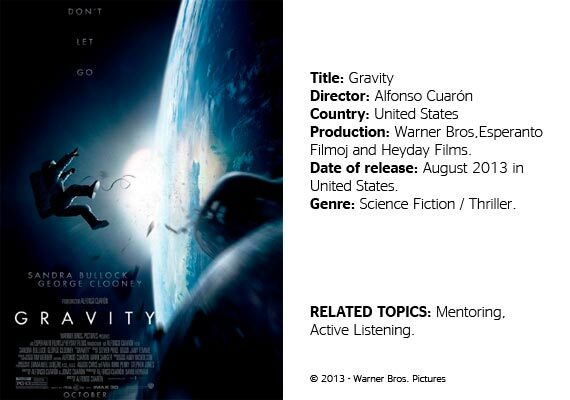 Tip: If you haven’t seen Gravity yet, go and see it. There will be few films as innovative and human as this masterpiece by the Mexican director established in Hollywood Alfonso Cuarón. And very few can teach as useful lessons on management for those who, like us, are experiencing times of crisis, adverse contingencies and risk situations. Just like the critical space circumstances in which Dr. Stone and commander Kowalsky find themselves in. Within the range of management issues offered by the movie, we can focus our attention on what I find most useful and close to all of us: how to achieve and maintain effective interpersonal communication with our co-workers and teams. In this regard Gravity is, as we will see, a comprehensive practical, anthropological treatise on communication and listening. The director’s grand thesis is thus discovered throughout the movie: that a human being alone is an incomplete being. For this reason, in its Latin etymology – “communio” – communication means sharing. We can bring these truths to our professional lives, even though they are often ignored. To better understand how a personal, i.e. real, and professionally-effective relationship is established between the two leading actors, we would do well to remember the reference framework that two psychologists, Joe Luft and Harry Ingham, developed to help us improve and understand human interactions. What led to the scheme known as the “Johari Window”, formed by the intersection of two columns (What I know and What I don’t know) and two rows (what others know and what others don’t know). 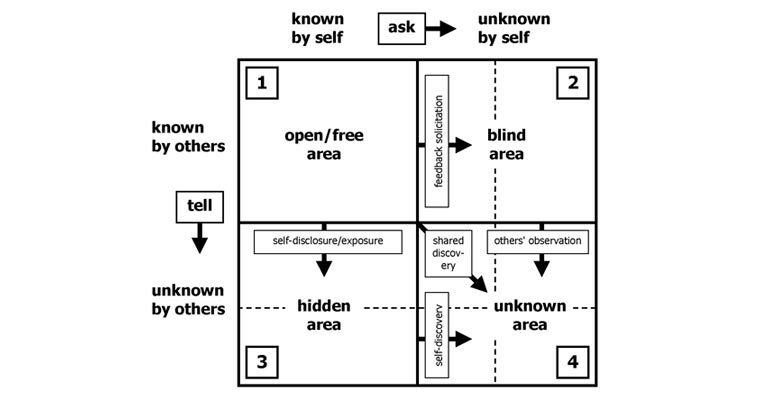 Which gives us four quadrants: Open Area, Hidden Area, Blind Area and Unknown Area, as shown in Figure 1. Let’s consider the starting situation: two project partners – Dr. Stone and commander Kowalsky – live at the beginning of the movie and before the accident with a negligible “Open Zone”. Their worlds are so different and distant: it is her first space mission, and her interest is scientific research with solar panels. Compounded by an introverted and taciturn nature, not accustomed to conveying personal information. Moreover, our astronaut is highly experienced. In fact this will be his last space mission, he shows no interest in and doesn’t even know the scientific part of the expedition and works in his space suit with country music playing in the background. In addition, the physical circumstances in outer space with their airtight clothing and suits seem insurmountable obstacles to smooth communication. For this reason, brevity in their respective communication occurs. There is no actual conversation: silences and monosyllables in routine tasks. That often happens in the vertical and horizontal communication in our organizations: a tiny “Open Area” entails “Hidden and blind areas” symmetrically as broad as suspicious. This is the problem of the isolated groups that are so common in our companies. So, back to the movie, there is only mere information (unidirectional) but not communication (bidirectional) between the two stars at the beginning. Authenticity, that progressively allows Sandra Bullock to express her ways of feeling without masks or personal reservations of the aforementioned hidden quadrants. Our star thus learns something that she had censored on Earth: to complain, to reveal her past pain. Warmth of George Clooney who, with patience, gains acceptance from the other party, without trying to get her to behave as he wants. The doctor continues to maintain her autonomy, personality and do things in her own way and be herself. Empathy, through the understanding by George Clooney of the grief felt by Sandra Bullock because of a deeply-traumatic event in her past. Openness, to the other party that turns a monological attitude into a dialogical one where there is room for conversation, once the blocking function of our internal judgments is deactivated. “The basis of man’s life with man is twofold, and it is one – the wish of every man to be confirmed as what he is, even as what he can become, by men; and the innate capacity in man to confirm his fellow men in this way”. This prodigy of a movie that Gravity is teaches us all that. A human being alone is indeed an incomplete being, also in times of crisis. We are not, as commander Kowalsky well knew and Dr. Stone learned from him, Robinson Crusoe. This is not a trivial discovery. Martin Buber, “Distance and Relation”, in: “Psychiatry”, vol. 20, May, 1957, pp.101-103. Antonio de Ulloa: the Discoverer of Platinum?